This verse has brewed in my heart for weeks. I learned years ago while memorizing scripture that it is often the little words in a sentence that carry immense weight. Think about it – “now faith is“! Hebrews is a book written to the Jews. Although they had the writings of the prophets and poetic scrolls, their spiritual understanding rested on the writings of Moses. This was their foundation of all truth. and much, much, much more…..
God can be taken at His Word! When a Jew would read “now faith is”, he knew beyond any doubt faith rests not our circumstances or personal ability, but fully on the foundation of The Word of God. 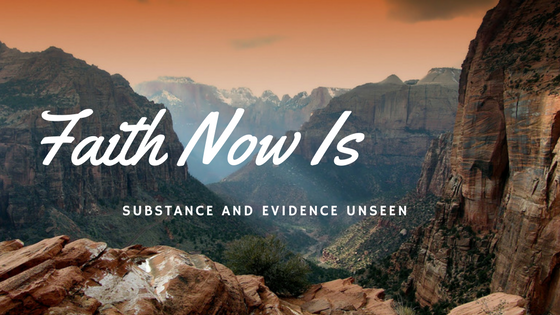 “Now faith is… substance.” “Now faith is… evidence.” Now! In fact, this very moment! The substance of what we hope for in prayer is now! The evidence of what we don’t yet see is now! The literal translation for Luke 1:37 is “with God’s word is the power to fulfill it.” As God speaks it is done! There are many things that I once needed faith to believe. I would struggle to apply some foundational truth to my life, usually because facts were confronting my path. There is a vast different between truth and fact. truth is they fell with a shout! truth is the wind of God lead the way! truth is God is Mighty! God says everything done without faith is sin! Rather than a condemnation, it is an invitation to walk by faith. This constant invitation to partner with Him and His Word is like a gate swung purposely open in our direction. Faith is activated upon truth. Whatever I need in faith today, He is! He never changes; His word is unfailing.